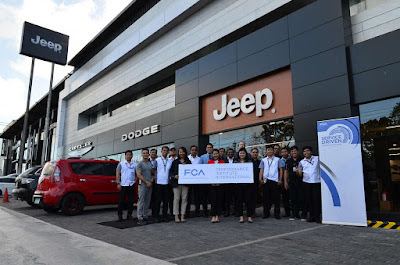 Coinciding with the Auto Nation Group (ANG)’s 15th year as the official importer and distributor of Chrysler, Dodge, Jeep, and RAM vehicles in the country, they have announced that they were appointed by Fiat Chrysler Automobiles (FCA) as a certified aftersales training hub for the Asia Pacific region. The selection of the Philippines as the aftersales training hub in the region is part of FCA’s plan aimed at increasing the technical skill level of aftersales teams across the Asia Pacific region. “Opening an FCA live training hub and cross-training others will start to enrich knowledge within the region, which is a win-win solution that drives toward better customer satisfaction. With many different geographical locations, the diversity of countries, and costs associated with travel, the new training center creates synergies and represents remarkable advantages for FCA General Distributors in the region,” said Adolfo Gonzalez Milano, head of FCA Asia Pacific Aftersales Training. FCA also said the selection of Auto Nation Group as training hub was due to several qualifiers, which included geographical location, distributor’s commitment, facility preparedness, and current skill level of the hosting General Distributor. This news comes as ANG also appointed a new Chrysler, Dodge, Jeep, and RAM dealer located in Clark, Pampanga. The new showroom, owned and operated by Autoport under the Laus Group of Companies, is the fourth showroom of the brand in the country.